attributed the economic advisor to the Prime Minister Haider al-Abadi, Monday, reasons for the high dollar in the local market to the deterioration of oil prices and reduce sales prices Central Bank of hard currency, as called for reducing the value of the dinar and raise the dollar value of sales for the launch of cash and "restrain" demand and ensure the stability of exchange rates. He said the appearance of Mohammed Saleh said that "the instability of the US dollar exchange rates in the Iraqi market and rising in recent months, due the deterioration of oil prices, "noting that it" led to the deterioration of the Iraqi payments rates because its exports base is oil. "Salehadded that" the Iraqi Central Bank action to reduce the direct sales of the dollar, instead of reducing the value of the dinar ", returned to this" creation market again to sell the currency. "Heexpressed his Economic Adviser to the Prime Minister's support" to lower the value of the Iraqi dinar in line with the market, as well as raise the sales value of the dollar, "adding that it" will launch a cash liquidity and restrain demand and contributes to the stability of the dollar exchange rate. 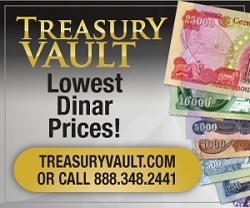 "Thespecialize in the banking sector attributed in (the ninth of April 2015) rise of the dollar against the dinar, to the Central Bank of special procedures to deduct customs duties and taxes in advance, and called for a "freeze" of the resolution, while the expected continued decline in the value of the Iraqi dinar, stressed the need to repeal Article 50 of the budget for determining the dollar sales. also complained Iraqi citizens, in (27 March 2015), the high prices of materials and goods in the Iraqi market, while calling for the government to support and follow-up and determine the prices of goods in the market, confirmed that the instability of the dollar was behind confuse the Iraqi market.